Can you keep your worlds from colliding? Chances are, at one point or another, you’ve longed for an opportunity to build your own little world. Now, you can do just that — sort of — through Super Planet Crash. 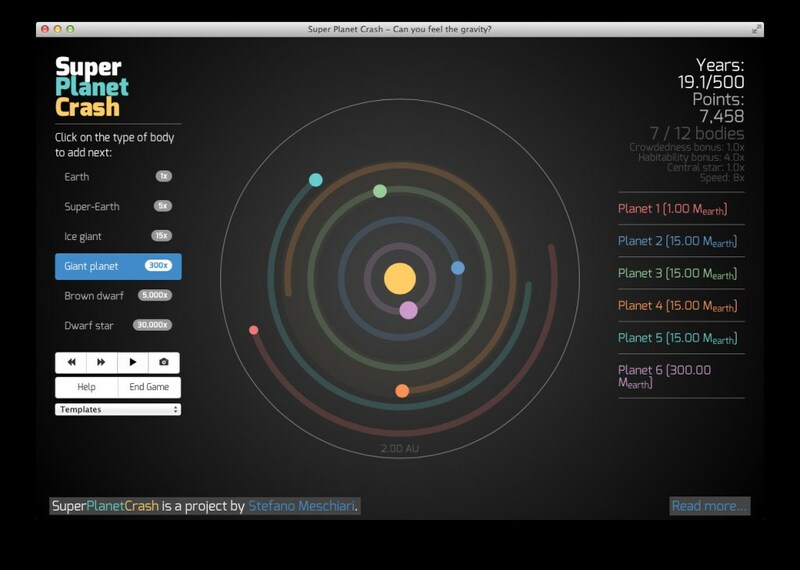 The online game allows you to create your own solar system and rack up points in the process. The premise is rather straight forward. To play, you select a combination of objects from a list (ice giants, super Earths, brown dwarfs, and so on) and attempt to assemble them into a stable planetary system. The more objects you add to your little corner of the cosmos and the longer your system remains stable, the more points you earn. Of course, as is true of all planetary systems, eventually it all comes crashing down. The first time one planet collides with another (or is ejected from the solar system), the game ends. Ultimately, Super Planet Crash is more than just a game. It can help individuals understand both the mechanics that govern orbital physics and the ultimate fate of our own solar system. In the game, some planets will revolve many, many times and seem stable. However, if you look closer, you’ll see that their orbits are slightly increasing or decreasing, and these fluctuations will eventually causes them to bump into other objects. In many ways, this process mimics our own solar system. Because we are here for such a short timespan (120 years at best), we get the impression that our region of the cosmos is steady and unchanging. However, that’s wildly inaccurate. Over the course of its 4.6 billion year lifespan, our solar system has changed dramatically. Even today, our seemingly docile neighborhood is filled with rogue objects that can throw everything into chaos (think asteroids, comets, meteors, and so on). In fact, in the near future (astronomically speaking), Mars’ moon Phobos is going to careen into the surface of its host planet and be obliterated. In that respect, the game ultimately helps users remember that our universe is in flux and constantly changing, with new objects continually being added and removed. 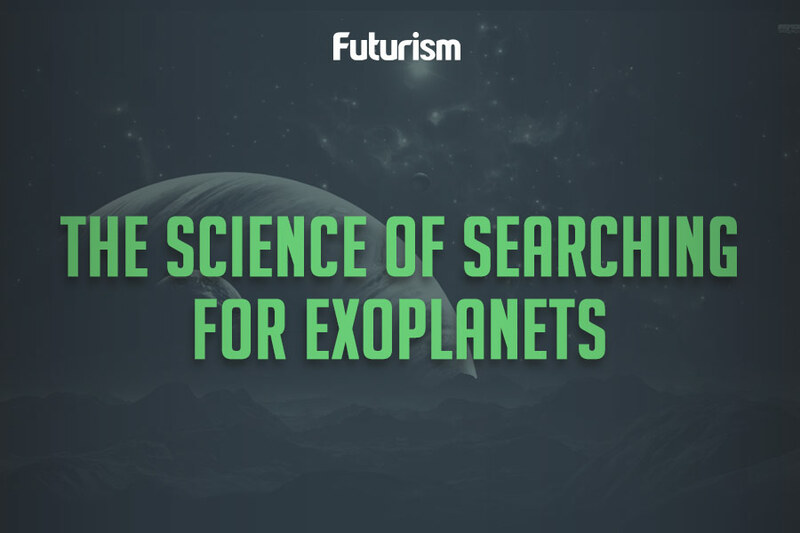 The addictive game (and it is addictive) is driven by the same software code that astronomers use to find exoplanets, which are planets beyond our solar system. Systemic Console is a scientific software package used to locate planets in the data that is gathered by telescopes like the Automated Planet Finder (APF) at the University of California’s Lick Observatory. Greg Laughlin, professor and chair of astronomy and astrophysics at UC Santa Cruz, developed Systemic Console with his students. “Systemic Console is open-source software that we’ve made available for other scientists to use,” Laughlin asserts in a UCSC news release. “But we also wanted to create a portal for students and teachers so that anyone can use it.” They succeeded as the game is a great avenue for explaining the impact that cosmological objects have on one another, as well as a fun way to introduce students to the topic of orbital dynamics. Co-developer Stefano Meschiari adds that the addictive nature of the game is beneficial to players. As users keep trying and trying to create a stable system, they begin to understand the relationship between planets, stars, and gravity. As he puts it, “It doesn’t take long for them to understand what’s going on with the orbital dynamics.” Eventually, if you get good enough and really come to understand how orbital dynamics works, you can create a system that lasts thousands of years. Head over to Super Planet Crash and give the game a go. Where else can you create your own universe?